Our Poolside rooms of which there are 12, contain 1 queen sized bed, cable television, direct dial telephone access, free high speed internet, and hot and cold showers. These rooms can accommodate up to 2 persons. 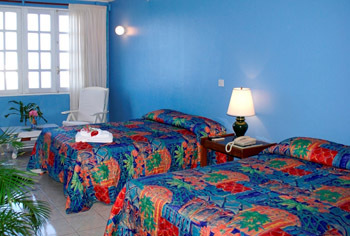 We also have 19 Oceanfront rooms, 2 of which contain 1 king sized bed. 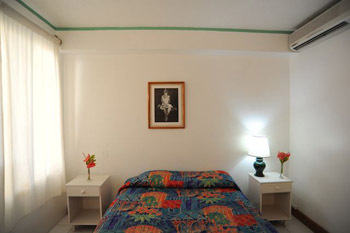 The remaining 17 rooms contain 2 double beds each and are able to accommodate up to 4 persons. For large groups an extra single bed can be placed in the rooms, at an additional cost, to accommodate up to 5 persons. They are equipped with, hot and cold showers, mini fridge, coffee makers, iron and ironing boards, cable television, direct dial telephone access and free high speed internet. All the rooms on the second floor contain private balconies with a spectacular view of the ocean.